As I read posts from my friends and family on Facebook, most are thinking about the upcoming holiday season; posting holiday photos, commenting on decorating their homes, and discussing the best toy deals! 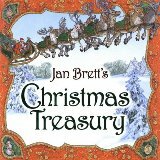 Jan Brett's birthday provides an opportunity for families to start reading a few Christmas books like The Twelve Days of Christmas and Christmas Trolls . Additionally, she has written and illustrated many books that are set during winter like her beloved The Mitten (Click here to have Jan Brett Read you this book) and The Hat . In all my experience celebrating children's author birthdays I have found that this celebration is a perfect match between the time of year and the author. 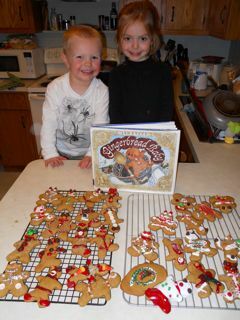 We had a fabulous time making these cookies. 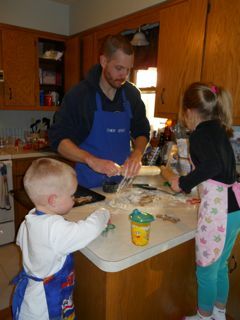 We made the dough in the morning and placed it in the refrigerator for many hours. The hour right before dinner, has come to be known as the "witching hour" in our house when the children are getting a little tired and cranky. Today, we were able to distract them with rolling out the dough, using the cookie cutters, and manipulating the hands and legs of the gingerbread babies as Jan Brett did for her book. 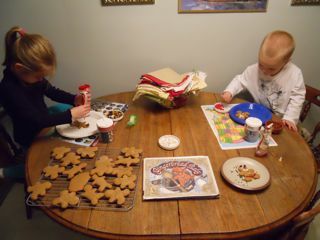 The cookies cooled while we ate dinner and then we cleaned the kitchen only to mess it up again with our decorating. 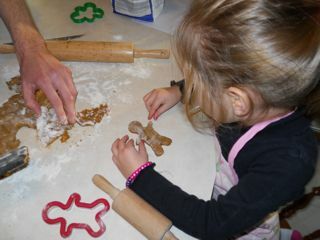 We had so much fun creating our gingerbread babies as each one took on its own personality. Some gingerbread babies had chocolate chip eyes and a red hot noses, some had "Smartie" buttons and "M and M" shoes, while others made by my son were "one-eyed alien Jedis!" We did choose to buy prepackaged cookie icing with a nice spout that made decorating possible for the kids. Also, check out Gingerbread Friends which is the sequel to Gingerbread Baby. "I was born on December 1st, and I'm a Sagittarius. I don't know very much about astrology, but I like the symbol for my birthday which is one half horse and one half a person shooting an arrow. Since I was six I wanted to illustrate children's books. But I had to wait until I was 29 years old to see my name on a book jacket. My first book was Fritz and the Beautiful Horses. It took much longer than I thought it would. I went to college and then to the Boston Museum of Fine Arts School. Have you ever wanted something so much that you were willing to work extra hard for it? That's what happened with my books. The thing that spurred me on was the idea that I could balance my story with just the right pictures. The pictures I created myself. I'm back from my book tour and am happily at work finishing up on next year's book, Home for Christmas. I'd love to tell you a bit about my work and travels in this month's Hedge a gram. Best Regards, Jan Brett." I hope everyone's holiday preparations are going smoothly without too much stress. If you are the procrastinating type and are not quite ready for holiday books, our family has two new favorite Jan Brett books: Daisy Comes Home and Honey... Honey... Lion! . Click here to view photos from her visit to the Mazza Museum on her Home for Christmas Bus Tour. Thanks for sharing. I really enjoy when you post pics of your kids. I'm terrible when it comes to the holidays, falling all over myself pretty much trying to get all the details lined up, but still enjoying every minute of it. It's wonderful! This year is even more so, since the Turkeybird is finally really getting excited to see Santa! Yay! Okay, so I love Jan Brett already, she's a Sagittarius just like me! Wahoo! No, that's not the only reason, but I do like that she mentioned how much work you have to put into the things we love. Such a great lesson to learn. We do love Gingerbread Baby but we have yet to make gingerbread. Maybe we'll give it a shot. You family makes it look easy. Very unique and colorful gingerbread babies!